Our weeklong Grommet Camp is second to none. Groms experience the joy of surfing in a ridiculously fun, safe and professional environment. 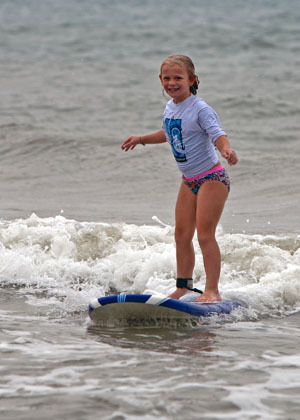 Our goal is to improve each camper's surfing ability whether they are hitting the waves for the first time or they are a few years in to a life-long surfing obsession. Before we go walk on water we cover the basics on land. This allows each student to practice important principles of surfing in a fun, safe and structured environment before hitting the waves. Through experience and observation we have learned those who excel in their chosen field always seem to do the simple things best. This is why we have chosen to focus our program on the basics of surfing and ocean safety. In order to maximize each camper's fun and energy without exhausting them for the next day we are offering a daily 3 hour long adventure. Our goal is to facilitate a positive life shaping experience for every grommet that comes to camp! Our 2:1 student to instructor ratio is the best in the business. This strategic personalized atmosphere promotes success in and out of the water by attending to each camper’s specific needs. Each Grommet Camp maxes out at 14 students. This enables us to facilitate an exciting camp atmosphere while managing controlled chaos. Treat your student to the experience of a lifetime this summer at JC Surf Camp! Confidence is key at Grommet Camp, therefore we facilitate an atmosphere of encouragement to get our campers off to the right start. Our proven methods are the result of thousands of hours of professional surf instruction experience. Every summer we are blessed by the individual students who come through JC Surf Camp and we look forward to creating an exciting, fun, and safe learning environment for anyone that wants to join our adventure. Weekly camps are held at Wrightsville Beach from 8-11AM. Sign up now to secure your spot before it’s too late!